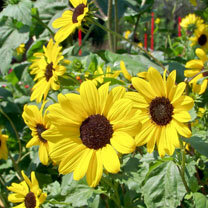 Sunflower (small flower yellow) is a well-branched sunflower with lots of flowers. The yellow flowers have dark hearts and are quite small. This sunflower is suited as a cut flower and is a bee and butterfly magnet. Frequent picking stimulates longer flowering. Flowers August-September. Height 150-200cm (59-79"); spread 70-80cm (27-31"). Sow the seed thinly direct into finely raked, moist, warm, weed-free soil where the plants are to flower, 13mm (½") deep, raking in lightly (Germination 7-21 days). As the seedlings grow thin in stages to achieve a final spacing of 30-45cm (12-18"). Support the plants as they develop. Alternatively sow indoors in April, carefully acclimatising plants to outside conditions and plant out mid-late May. Ideal for beds and borders. Attractive to butterflies, bees and birds. Prefers full sun.